Click here to see a Flickr album showing the progress of this water saving SIP container garden over the past year. The newest photos are at the end of the album (scroll down). All of us have a right to our opinions but this one about container gardening is a bit over the top in my view. 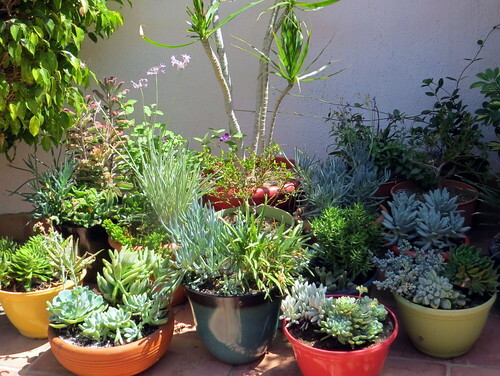 This garden writer believes that container gardening is overrated and not sustainable. I have never read an opinion like this before, particularly in this age of urbanization. It might be valid if the premise is based on the use of traditional drain hole pots and wasteful drench and drain watering. Even this is a stretch in my opinion. It is well documented that sub-irrigated planters (SIPs) will save water in a drought while producing healthy plants even in the concrete jungle. Apparently the writer does not really understand how SIPs work. Further, does the writer know that 95% of Californians live in cities and 80% of Americans across the country according to the 2010 census? Urbanization is a national reality and will likely continue to be in the foreseeable future. How are people who live in high-rise buildings with balconies supposed to grow some fresh food? SIPs are a perfect solution for them. There is no water dripping to annoy neighbors below and the productivity is top notch. Also, what about all of the people who live in low-rise buildings where only the ground floor residents might have access to a small yard. What are nomadic renters supposed to do, particularly young ones leading hectic urban lives? Is the writer’s premise that everyone without a yard with dirt must join a community garden to grow fresh food or shop at a farmers market? This is obviously not a reality for the majority of city dwellers. I read many garden writer columns. Few understand “self-watering” no less understand that professional growers call it sub-irrigation. We badly need horticulture/gardening education reform. It will take a while but if we don’t start now it will never happen. Like so many fads too often are, container gardening is overrated, and is actually contrary to the currently most faddish of fads--sustainability. Plants in containers need more regular watering than those that can disperse their roots more extensively into the ground. Those that are so indulged also want fertilizer to be applied more regularly, but are more likely to be damaged if fertilized too generously. Because confinement is stressful, plants in containers are innately more susceptible to disease and pests. Some plants need more pruning for confinement.